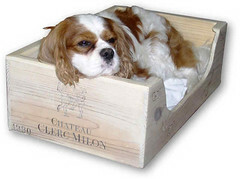 For those of you who have a fine taste for wine and also are avid recyclers, then Wine Crate Dog Dishes and Dog Beds may be just for you and your furry wine connoisseur friend. The company, Whiner and Diner, takes recycled wine crates from European and Californian vineyards to make doggie beds and doggie dishes out of them. (Insert drunk dog joke here.) Both the beds and dishes are hand-crafted and can be personalized with your pet’s name or a design. Perfect for that dog that guards your wine cellar. This entry was posted on Thursday, May 10th, 2007 at 3:50 am	and is filed under Dogs, National Dog, Cat & Pet Info, Products & Services for Cats & Dogs. You can follow any responses to this entry through the RSS 2.0 feed. Both comments and pings are currently closed.